Relaxation and quality time to unwind is essential to our sense of well-being. 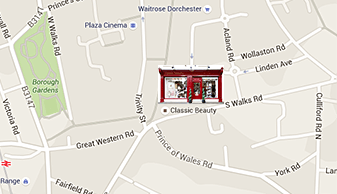 Here at Classic Beauty we aim to carry out all aspects of beauty treatments in a relaxing calm atmosphere. We feel professional skin treatments are an essential part of your beauty regime. That is why we have chosen what we consider to be world leaders in facial and body products. Guinot and Dermalogica, pioneer new standards for product performance using the finest ingredients available. We highly recommend both these products. Other treatments include, waxing, manicure and pedicure, Shellac, massage, eye lash extensions, ear piercing. Our therapists also have advanced training in make-up using id Bare escentuals, a pure natural mineral based make-up. A non-invasive cosmetic practitioner visits on a regular monthly basis. Gift vouchers can be purchased for any treatment or monetary value. Offering a complete range of skin, body and nail therapies in a calming soothing ambience to ensure total relaxation and rejuvenation. At Classic Beauty we are constantly updating our skills and therapies to cater for today’s demands. With late evening opening and a nearby car park come and visit our oasis of calm today!